Cervical arterial dysfunction (CAD) is an umbrella term used in manual therapy and physiotherapy to cover a range of vascular pathologies which may lead to cervico-cranial ischaemia. CAD is inclusive of all known vascular pathologies and anatomical structures that may be compromised by movement or manual therapy. Further, the clinical model of CAD incorporates the notion of assessing for patients presenting to physiotherapists with neuromusculoskeletal neck and head pain who may have an increased risk of developing an associated pathology. To identify the risk of developing arterial pathology during assessment or intervention. The IFOMPT document provides clinical reasoning and physical examination guidance for clinicians and highlights the need for manual therapy clinicians to be cognisant with the concept and details of CAD. Much of the information on this page is detailed further in the IFOMPT document. Note: The term should not be confused with cervical arterial dissection which is also referred to via the acronym CAD. This relates to a single, specific pathology (see below). CAD itself is not a specific pathology diagnosis. Thus, there is a variation in clinical presentation which is dependent on the structure involved, the pathological mechanism and the stage at which the dysfunction presents. CAD is of relevance to clinicians due to the fact the pain is often an early presentation of many types of arterial dysfunction, Fig 1. Later ischaemic manifestations of CAD, such as cranial nerve dysfunction and brain ischaemia, may be latent and develop hours, days or weeks after onset. Table 1 (below) details the range of presentations and associated clinical symptoms. The contemporary approach to risk assessment of the cervical spine incorporates a systems based approach. This differs from previous paradigms by considering the complete intra and extra cranial arterial supply of the cervico-cranial region, and the wide range of associated pathologies. This includes the anterior cervical arterial system i.e. the common carotid artery (CCA) its related branches (internal and external) and pathologies, in addition to the previously considered posterior circulation, i.e. the vertebrobasilar arterial system (VBA). 1. 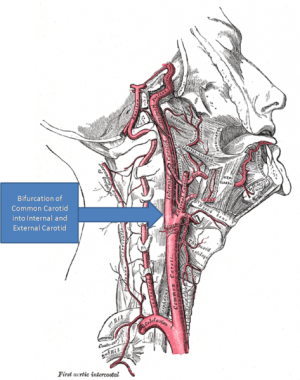 The internal carotid artery (ICA) provides the most significant proportion of blood to the brain. 2. Pathological changes of the ICA leading to stenosis are very common. 3. Blood flow in the ICA is known to be influenced by movement of the neck. 4. The ICA is commonly implicated in ischaemic stroke (see http://www.youtube.com/watch?v=442s9a_TEL8 ). The two ICA’s carry around 80% of the blood flow to the brain compared to the 20% via the posterior system. It is primarily increased flow through the ICA and the presence of an intact circle of Willis, which helps maintain brain perfusion in the presence of vascular compromise in other parts of the system (i.e. vertebral arteries). Blood flow through the ICA is influenced by movement of the cervical spine i.e. primarily extension, and less so, rotation. To understand the relationship between the CA’s and stroke. The ECA is a major artery of the cranio-cervical region. It arises from the common carotid artery at a bifurcation point around the C3 level (upper thyroid cartilage). It eventually forms the occipital artery and terminates in the maxillary artery and superficial temporal artery which may be implicated in cases of headache linked to temporal arteritis. It is this tethering, combined with the convoluted route of the vessels around C2/C1 and the occiput, which have been a cause of historical concern for manual therapists. Considering the anatomy of the upper cervical spine it is easy to appreciate how, during rotation, the contralateral vessel may be stretched, therefore potentially affecting flow (Fig. 2). Once inside the skull, the two vertebral arteries join each other to form the basilar artery, which in turn feeds into the circle of Willis. When there is a reduction of blood supply to specific parts of the hind-brain, certain signs and symptoms are displayed. This is what is referred to as VBI. Care must be taken when discussing the epidemiology. CAD is an umbrella term, and as such it is necessary to consider the epidemiology of each pathology. First, the correct population must be identified, relative to the inquiry. For example, the rate of VBI following cervical manipulation is a different matter to the prevalence of VBI in a population. Such data may help the clinician to judge the likelihood of a patient with head/neck pain having CAD. This is a difficult question to answer with existing data as the concept is new. Nevertheless, to help judge the size of the problem, the following data can be considered. As stroke / TIAs are a primary concern, the following data sets the scene. Ischaemic stroke is the 3rd most common cause of death in western populations, and in US/EU populations has a crude incidence of between 81 and 267 cases per 100,000/year. Most of these events are related to atherosclerotic disease processes, with a minority related to non-atherosclerotic dissection events or mechanical phenomena. Historic obsession in manual therapy with the vertebral artery and dissection in particular, means that the only data available pertains to dissection of the vertebral artery following manipulation. This data is of course important but represents a very small part of a big picture. No consideration has previously been given to the other potential structures and pathologies that may result in delayed diagnosis or adverse events. If just these data are considered, then the best estimates from the most recent studies suggest that the risk of vertebral artery dissection following manipulation is around 6:100,000, compared to a normal occurrence of around 1:100,000 This relates only to dissection events, There are no known data for the rate of ICA-related events following treatment due to the fact that this notion has only recently been introduced. Further, there are no known systems for collecting and collating such adverse events, so the actual rates are unknown. A third way of framing the epidemiology is in terms of the proportion of people visiting physiotherapists who may have or develop CAD. This is the number of people with head and/neck pain who have a CAD-related pathology as the source and cause of that pain. Unlike haemorrhagic events where a headache is most often overshadowed by focal signs, ischaemic and atherosclerotic pathologies very often present with neck pain and headache as their first and most overt symptom. Headache attributed to cranial or cervical vascular disorder is formally classed as a secondary headache by the latest International Headache Society criteria. The prevalence of this, and this as a proportion of all headaches, is unknown, but very likely to be epidemiologically small. Furthermore, it should be remembered that migraineous headache itself is a known risk factor for CAD. The epidemiology related to identifying those neuromusculoskeletal patients who may be more at risk of developing CAD is of course integrated with the above data, but even more complex to specifically identify. 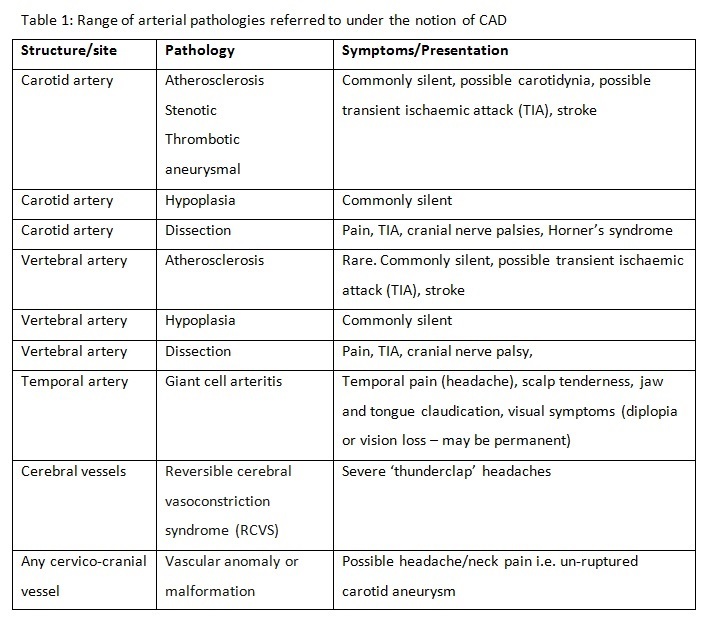 CAD-model reasoning would involve an understanding of the above data, together with an understanding of the societal level of vascular disease – atherosclerosis is the biggest single cause of death and morbidity in the western world - integrated with assessment of features of presentation and an individuals risk factors (see below). Summary - the overall chance of a patient presenting with head and neck pain having a CAD-related pathology is very small. Presence of specific signs and symptoms, together with collation of known risk factors will influence this a priori probability judgment. CAD is an umbrella term covering a broad spectrum of potential pathologies. These range from pre-existing underlying anatomical anomalies, vasospasm, atherosclerosis, through to giant cell arteritis (i.e. temporal arteritis) or arterial dissection. All of these may lead to potential cranio-cerebral ischaemia which may originate and manifest in a variety of ways. Presentations range from pain, through to cranial nerve dysfunctions, sympathetic nerve dysfunction (e.g. Horner’s Syndrome), blindness, stroke, or at worst, death. A spectrum of potential patho-mechanisms of ischaemia and related symptoms are covered in table 1. The key thing for the clinician is to be able to risk assess adequately for CAD prior to physical examination or exercise intervention. As pain may be the only initial complaint and a decision must be made as to whether this is simply a benign neuro-musculoskeletal (NMS) complaint or the pathogenesis of a neuro-vascular problem. Table 1 describes the range of possibilities. Absence of a plausible mechanical explanation for the patient’s symptoms. Signs and symptoms of serious pathology and contraindications / precautions to treatment may manifest during the patient history stage of assessment. This is an opportunity to observe and recognise possible red flag indicators such as gait disturbances, subtle signs of disequilibrium, upper motor neuron signs, cranial nerve dysfunction, and behaviour suggestive of upper cervical instability (e.g. anxiety, supporting head/neck) or associated ischaemia, early in the clinical encounter. It is important to consider the information below in the context of the aforementioned risk factors. Acute onset of pain described as "unlike any other”. Hindbrain stroke (e.g. Wallenberg’s syndrome, locked-in syndrome). Some important points are made with regard to decision making for the physical examination are highlighted in the IFOMPT document. Are there any precautions to orthopaedic manual therapy OMT? Are there any contraindications to OMT? The above are generally normal practice for most experienced manual therapists. However, the following two items, frankly should be normal practice also, but are explicit in the document. "What is the priority for these physical tests for this specific patient? What is the order of testing and to which tests should be completed at the first visit? A patient presenting with bona fide neuromusculoskeletal condition, but with an identified risk of developing a CAD (nCAD2, e.g. smoker with hypertension and diabetes) should be treated with appropriate caution. 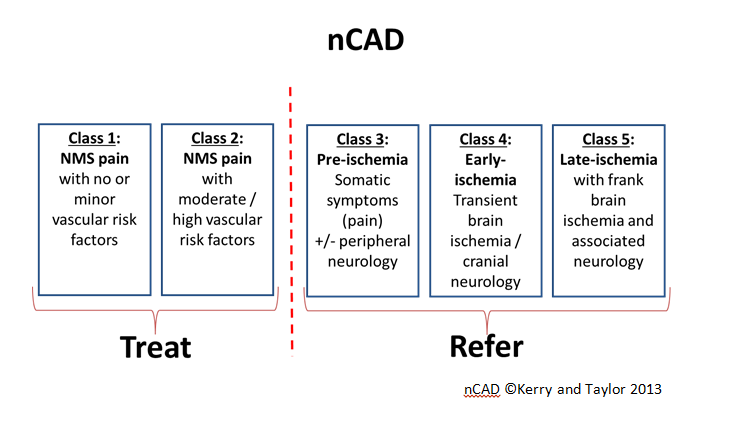 Physiotherapy management of a patient with a suspicion of CAD-related pathology (nCAD 3-5) requires referral for appropriate medical assessment (usually with a vascular or neurological physician). It is essential that clinicians make appropriate triage decisions, concomitant with the urgency of the presenting condition. Taylor AJ, Kerry R. 2008 How to recognise vascular flow problems in athletes – a clinical reasoning exercise. Sportex Medicine. Rushton A, Rivett D, Carlesso L, Flynn T, Hing W, Kerry R, International framework for examination of the cervical region for potential of cervical arterial dysfunction prior to orthopaedic manual therapy intervention, Manual Therapy 2013, doi:10.1016/j.math.2013.11.005. ↑ Kerry R, Taylor AJ, Mitchell J, McCarthy C, Brew J. Manual therapy and cervical arterial dysfunction, directions for the future: a clinical perspective. J Man Manip Ther. 2008;16(1):39-48. ↑ Boyle E, Côté P, Grier AR, Cassidy. Examining vertebrobasilar artery stroke in two Canadian provinces. Spine (Phila Pa 1976). 2008 Feb 15;33(4 Suppl):S170-5. doi: 10.1097/BRS.0b013e31816454e0.fckLRJD. Debette S, Leys D. Cervical-artery dissections: predisposing factors, diagnosis, and outcome. Lancet Neurol. 2009 Jul;8(7):668-78. doi: 10.1016/S1474-4422(09)70084-5. Review. PubMed PMID: 19539238. Metso TM, Tatlisumak T, Debette S, Dallongeville J, Engelter ST, Lyrer PA, Thijs V, Bersano A, Abboud S, Leys D, Grond-Ginsbach C, Kloss M, Touzé E, Pezzini A, Metso AJ; CADISP group. Migraine in cervical artery dissection and ischemic stroke patients. Neurology. 2012 Apr 17;78(16):1221-8. doi: 10.1212/WNL.0b013e318251595f. Epub 2012 Apr 4. PubMed PMID: 22491867. Debette S, Metso TM, Pezzini A, Engelter ST, Leys D, Lyrer P, Metso AJ, Brandt T, Kloss M, Lichy C, Hausser I, Touzé E, Markus HS, Abboud S, Caso V, Bersano A, Grau A, Altintas A, Amouyel P, Tatlisumak T, Dallongeville J, Grond-Ginsbach C; CADISP-group. CADISP-genetics: an International project searching for genetic risk factors of cervical artery dissections. Int J Stroke. 2009 Jun;4(3):224-30. doi: 10.1111/j.1747-4949.2009.00281.x. PubMed PMID: 19659826. Metso TM, Debette S, Grond-Ginsbach C, Engelter ST, Leys D, Brandt T, Pezzini A, Bersano A, Kloss M, Thijs V, Lyrer PA, Tatlisumak T, Metso AJ. Age-dependent differences in cervical artery dissection. J Neurol. 2012 Oct;259(10):2202-10. doi: 10.1007/s00415-012-6485-7. Epub 2012 Apr 18. PubMed PMID: 22527225. Debette S. Pathophysiology and risk factors of cervical artery dissection: what have we learnt from large hospital-based cohorts? Curr Opin Neurol. 2014 Feb;27(1):20-8. doi: 10.1097/WCO.0000000000000056. PubMed PMID: 24300790. Engelter ST, Grond-Ginsbach C, Metso TM, Metso AJ, Kloss M, Debette S, Leys D, Grau A, Dallongeville J, Bodenant M, Samson Y, Caso V, Pezzini A, Bonati LH, Thijs V, Gensicke H, Martin JJ, Bersano A, Touzé E, Tatlisumak T, Lyrer PA, Brandt T; Cervical Artery Dissection and Ischemic Stroke Patients Study Group. Cervical artery dissection: trauma and other potential mechanical trigger events. Neurology. 2013 May 21;80(21):1950-7. doi: 10.1212/WNL.0b013e318293e2eb. Epub 2013 May 1. PubMed PMID: 23635964. Mughal MM, Khan MK, DeMarco JK, Majid A, Shamoun F, Abela GS. Symptomatic and asymptomatic carotid artery plaque. Expert Rev Cardiovasc Ther. 2011 Oct;9(10):1315-30. doi: 10.1586/erc.11.120.